For most of my life, the Saturday before Thanksgiving was known as Rivalry Weekend. It was the Saturday when USC played UCLA, Stanford played Cal, Michigan played Ohio State, etc. During the late 90s, I had my own personal rivalry: The California Bar Exam. I failed the exam 5 times. It’s a three day exam, given at the end of February and at the end of July. The February results come out at the end of May. The July results come out on the Saturday before Thanksgiving. In my case, the question almost became a Thanksgiving tradition. There was also a deep disappointment in thinking about studying for the next exam. But, I finally passed on time #6. Again, the guy and his firm are really well-connected, so there may be a contact that leads to an investment. But, our company was not in his space, so he passed on the offer. Since we had our fantastic babysitter watching our son for Friday night and Saturday, we decided to have an overnighter in Santa Monica. 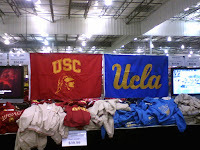 On the television screens was UCLA vs. USC. And, that reminded me that it was rivalry weekend. I thought about all the times that the Bar exam had beaten me. I thought about all of the frustrations that the Bar exam had caused. And, I thought about how all of that pain and disappointment was in the past, far, far removed from my current life. I am going to release an instructional video about how to pass the Bar exam. There is a certain way that you need to approach the questions. I am not talking about some type of positive mentality — although that doesn’t hurt. I am talking about a specific way of answering the essay questions. I will release my instructional video, hopefully, before the end of the year. Yes, I am busy with the startup, but this is something that I have been thinking about doing for almost 20 years, and with the passage rates this low, this is an ideal time to release the video. Don’t expect any Academy Awards, but do expect good results. And, of course, I will give you a money-back guarantee if you don’t pass. The video will be economical: $49. IMO, just hearing me tell my stories about my different failures is worth $49! Glad you (finally) made it, Victor! Good luck with your startup. Startups are fun. Lots of work but great energizer. I've done many. No regrets.